Bluetooth Keyboard - This is the most important part. A bluetooth keyboard, which you can find a variety from different price points on Amazon, makes it a lot easier to type. I have one from Belkin that I got on sale from Office Max or Office Depot a long, long time ago. You can find keyboards with soft case to them that prop up your keyboard - that's what I initially bought, however I prefer using my other Belkin case & my keyboard on a little lap desk from when I was a kid. It's a super awesome set up. I find that the bluetooth keyboards with the soft cases really don't give you a way to store your iPad & the keyboard together. I'm scared that keys are going to pop off if you just stuff the keyboard in your bag so I put my pad & my keyboard in another little felt pouch. On my wishlist right now is a Clam Case, however. This amazing contraption turns your iPad into a mini laptop! You pop the iPad in & it folds up like a laptop to protect everything - your pad & your keyboard! But the main point of this is if you don't have a Bluetooth key board it is really hard to blog from the key board on the screen. You get a more ergonomic experience with a Bluetooth keyboard and it's more like typing on a laptop or desktop. It's easier & more comfortable. Blogging Apps - You know, I almost called it Blogging Software but if it's on a tablet...does it count as software? I guess it does but they are more commonly referred to as apps. So there are quite a few out there depending on your platform. There are quite a few apps that work with quite a few platforms & there are quite a few apps that only work with certain platforms. Currently on my iPad I have the apps Blogsy, BlogGo, & Blogger. (Here is a link to an article with other blogging apps you might want to try). Because there are so many apps out there for different needs you might have to try a few before becoming sold on one. The downside to that is a lot of these blogging apps are quite pricey. the Blogger app is free, but not the best. Blogsy is $4.99 and has the most options control. BlogGo, designed by a blogger, is $1.99 and one of the most affordable apps that offer more control than the Blogger app. I will do a separate post reviewing these apps shortly since there's a lot to compare! Sharing Apps - Since I have the latest (until, what, September?) iPhone, it has a better camera than my iPad. Also, who wants to be that person taking photos with their iPad? I use my phone & my DIY lightbox to take pictures for my blog and getting the photos between my phone & my iPad to edit is easier with the built in Photo Stream sharing between devices. But say I am running out of room on my phone or iPad and want to save some pictures or video or whatever to edit later, thats where other sharing apps come in handing. You can also pull from these apps to your computer. The current apps I use are DropBox & Google Drive. You can access these across devices and it clears up space from your device. Limitations - However, there are some limitations to blogging from your iPad like designing your blog. While you could probably use apps to help you make elements for your blog (though, really, I would not suggest that) there is really no way for you to implement the design on your blog. Speaking just from Blogger as an example, it is best to use your laptop. You can access the template design & customized options (at least in Chrome -my preferred browser) but you can't see your whole blog in the preview. You also can't move your widgets around in the Layout page. So an iPad will not replace your main computer for designing. I would suggest maybe if you have a family computer or maybe just one desktop/laptop in your family it might be an easy step for you to blog from your iPad and use the family computer to design. This is an option to save a bit of money if you're getting really into blogging & you can't take up all the time on the family computer or maybe you want to save a little bit of money rather than investing in another laptop especially if your an Apple fanatic like I am! 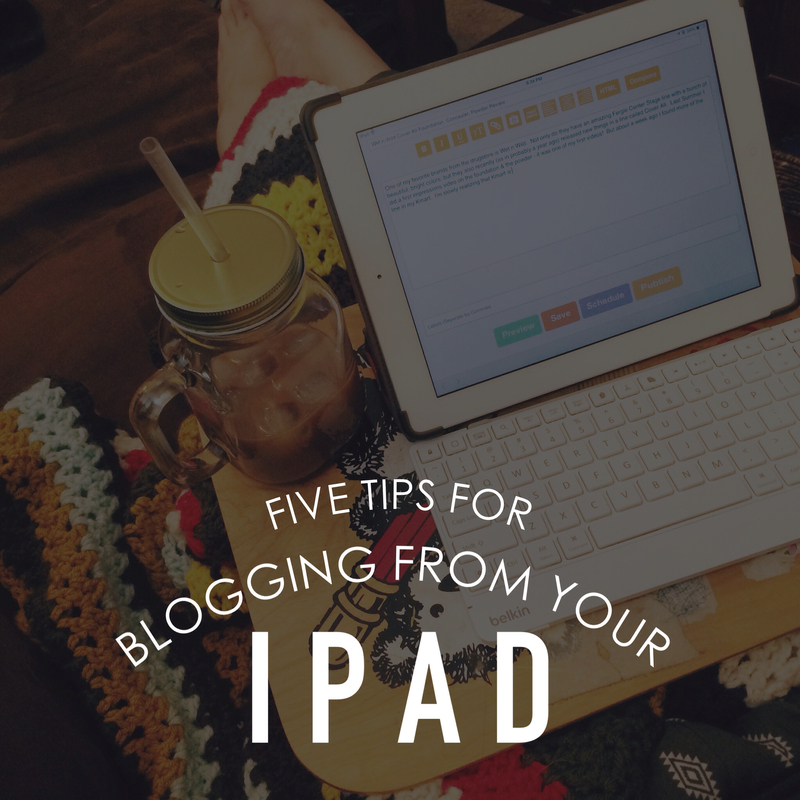 These are the five important things when it comes to blogging from your iPad or other mobile device. Of course, I can only speak for Apple products since thats what I've got but I'm sure you could blog from any other tablet. I know at least Microsoft has a lot of crazy integration with their desktop applications, but I can't really speak to it. Also, if your concerned about the lack of a mouse - don't worry, its not that unnatural to reach up & select rather than move a mouse. Ever since I've been blogging from my iPad I've gotten used to it. It's so weird how we adapt to things, in general everyday life, but in technology as well. I find it super impressive that we can adapt to different softwares, etc being a part of this technological age. Do you blog from your mobile device? What apps or techniques do you use?